For those who spew non biblical phrases such as “Hate the sin, love the sinner”, “God does not hate” and “Where does the bible command you to hate anyone?” I have decided to prove a few facts here of what the KJV BIBLE actually says about God hating as well as the righteous hating. And not just hating the sin, but hating the person! BTW, “hate the sin, love the sinner” is nowhere in the KJV Bible. Nowhere! 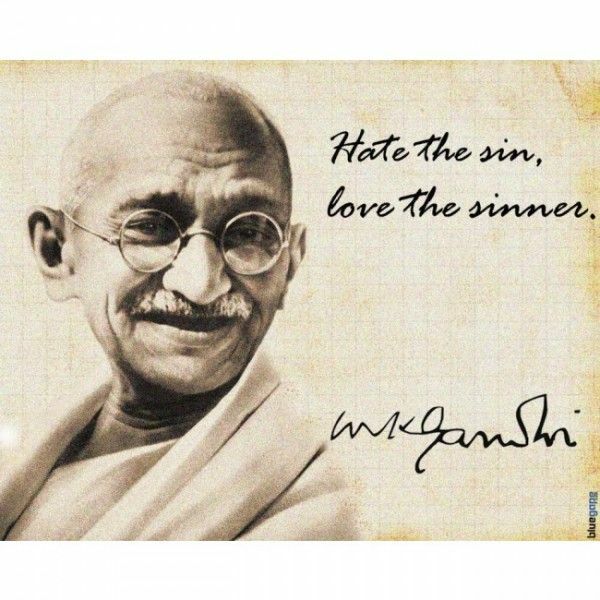 It is actually a quote from an anti-Christ named Mahatma Gandhi who seems to have borrowed it from some pervert Catholic Bishop. Both of them wicked persons are burning in hell right now. Here are just a few examples of both the LORD hating people as well as several examples of the righteous hating people as well. Not just hating the sin, but hating the wicked person! How about the righteous men of God? Can they hate people as well? Let love be without dissimulation. Abhor (hate) that which is evil (evil such as the LGBT); cleave to that which is good. 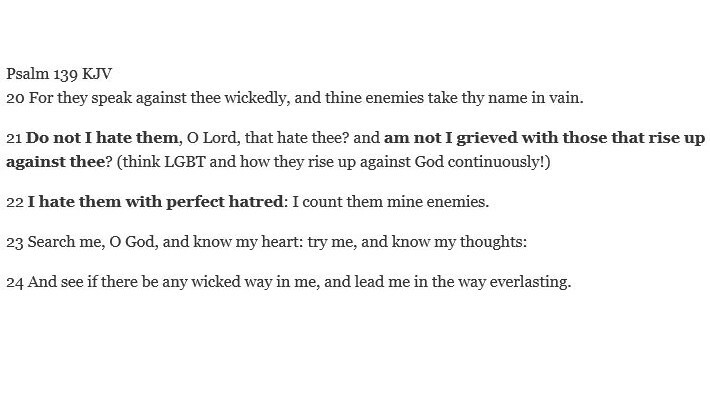 Look what King David said to God about wicked people who attack God like the LGBT do! Amen brother – I had a sermon in mind but this blog got me started on writing it! And here it is. Cool. I will check it out. I have tried witnessing to sodomites in hope they will turn to the LORD & repent of their wicked ways. No matter how I approached them, they would NEVER listen! I thought I was doing something wrong, but now I realize I was only casting pearls before swine. I will not waste my efforts on them any longer, when there are many more lost souls that have a chance to be saved. Sodomites really ARE reprobates. I am grateful that Pastor Anderson has the GUTS to call evil, evil. You mentioned that they were both burning in hell right now. The perverted bishop and ghandi. I am not a supporter of either and I do agree that God hates people also with sin it’s written jacob I loved but esau I hated but I have never read anything in the Bible of anyone burning before the day of judgement. And he’ll is a state or condition the Bible speaks about the lake of fire. So can you please explain where you got people burning in hell from and also by you saying that I assume you believe in going to heaven, because burning in hell after death and going to heaven usually go hand in hand. Which I’ve never read the Bible say anyone is going to heaven so can you please explain where in the Bible it says God was going to take anyone to heaven because all I have ever read is him wanting to live on earth and the only person that wants to go to heaven in Satan. Read Revelation. Hell will be tossed into the lake of fire. And death and hell were cast into the lake of fire. This is the second death. And whosoever was not found written in the book of life was cast into the lake of fire. Hell is where they are BEFORE the lake of fire. This whole thing INFURIATES ME. I’ve lived my entire life under the boot of the wicked, and now, in 2017 I can see the Last Days. Never actually have had a chance to truly LIVE, chase dreams and build something meaningful. Nope, I lose out on all of God’s glorious offerings of prosperity, marriage and homestead, because the WICKED HAVE DESTROYED THE WORLD, AND WE’VE HAD A HISTORY OF COWARDS THAT LET IT GO BY. We are to love our own enemies. We are NOT to love the enemies of God. Which would be the “world” that is working iniquity against God. Most people are just lost unsaved people. But there are wicked reprobates (already damned) who got that way by rejecting God until God rejected them. You can know them because they constantly attack God. i.e. Queers who find a cake maker who won’t bake a queer themed cake and then proceeds to obsess with destroying the Christian cake maker rather than go buy a cake from the many others who would create a perverted cake to their liking. BTW. Loving such people makes YOU the enemy of God.